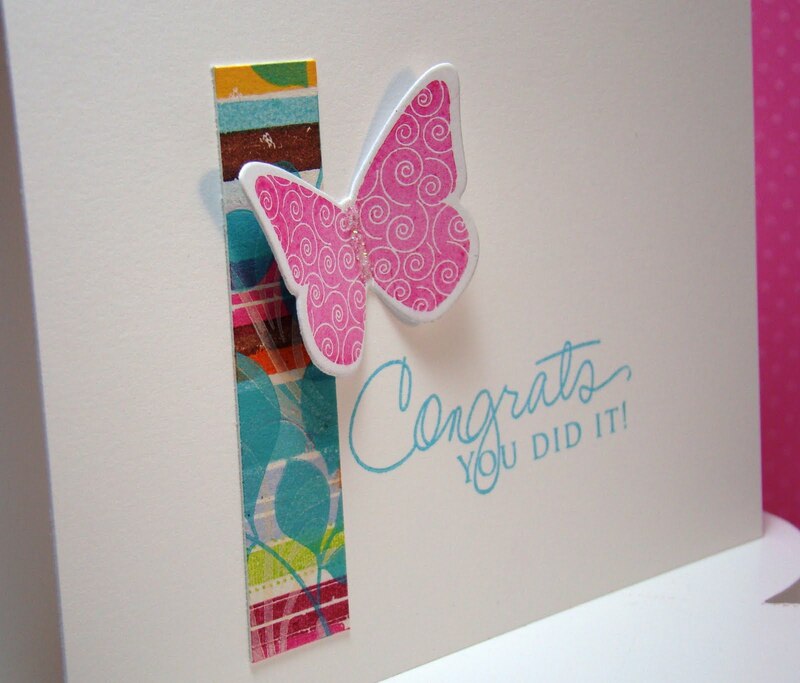 Yesterday I showed you a card that I made that used a piece of patterned paper made with "Distressed Stripes" and a couple other stamp sets. 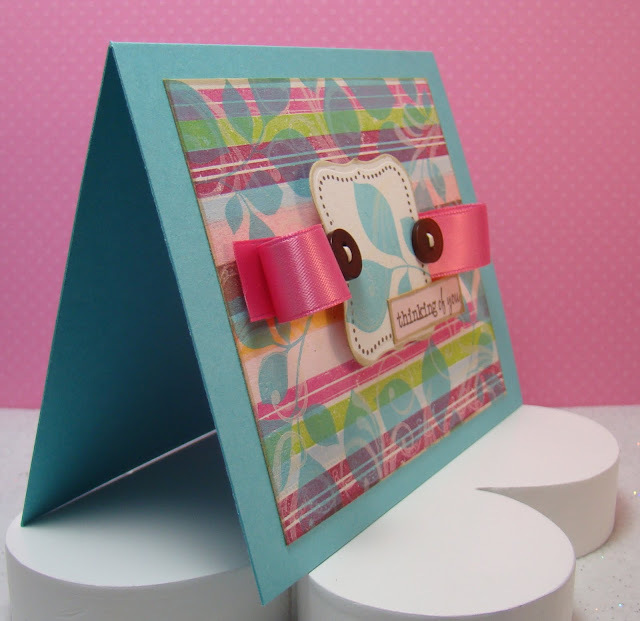 Today I wanted to show you a 2nd card that was also made with this same stamped paper. It is very simple and also VERY similar to several cards that I posted last week only this time I also used a piece of tiny patterned paper that I had left over (I have one more card that I made using this same paper). 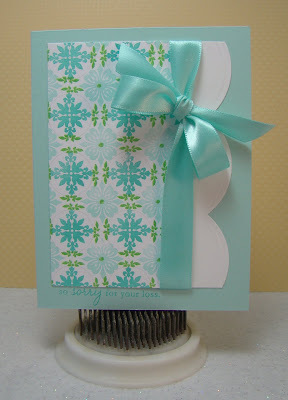 This is a card that could be made with any patterned papers and I'll probably try this same layout again! I think it adds an extra specialness though that it is all hand stamped! In the photo above, you can see the paper detail a little more closely! Hope you enjoyed the card today! Thank you for stopping by! I'd love to hear what you think! You are going to be so sick of "Distressed Stripes" before long! I just can't quit using them! I find inspiration everywhere for this set of stamps! 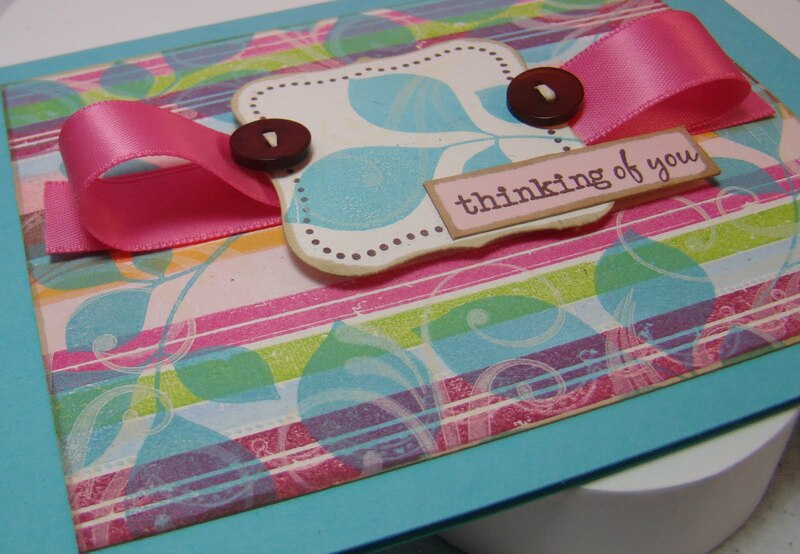 I had SOOOO much fun making this paper and these cards. I want to show you the paper first. That paper started out as a piece of PTI Rustic White! I used quite a few colors and stamps to turn it into this! I started with the "Distressed Stripes" stamp set and used PTI Sweet Blush, Raspberry Fizz, Hawaiian Shores, Summer Sunrise & Spring Rain inks. Then, I also added Jumbo Java & Pixie Dust VersaMagic and Palette colors Bordeaux, Chartreuse & Orangerie. After I stamped that, I stamped a leaf image from "Turning a New Leaf" with Hawaiian Shores around the edges. Then, I used a swirl from "Fancy Flourishes" in Vintage Cream ink and stamped on top of all that, also staying around the edges. And, wa-la!! I love the end result. I made 3 cards using this one small piece of paper. I'll share my favorite of them with you today (and yes, this is my 2nd post for today!). I am so happy with how this turned out. I love, love all the color in it! The buttons on the side of the label are chocolate brown but I realize that it's hard to tell from this photo. Here's a closeup of the stamping so you can see a little more of the detail. I used a scalloped stamp from Hero Arts to kiss off some of the ink in a few of the largest solid stripes. You can see this a little on the bottom bordeaux strip. I also had to share the back with you! I did something fun and stamped polka dots in Hawaiian Shores ink all across the back. I thought it added a fun detail! I also stamped my custom designed-by stamp on there too (but don't look TOO close because I smudged it a little). Thank you so much for stopping by! 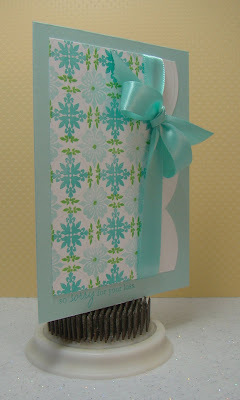 Be sure to check back tomorrow and I'll share the 2nd of the cards I made using this paper. I'd love to hear your comments! 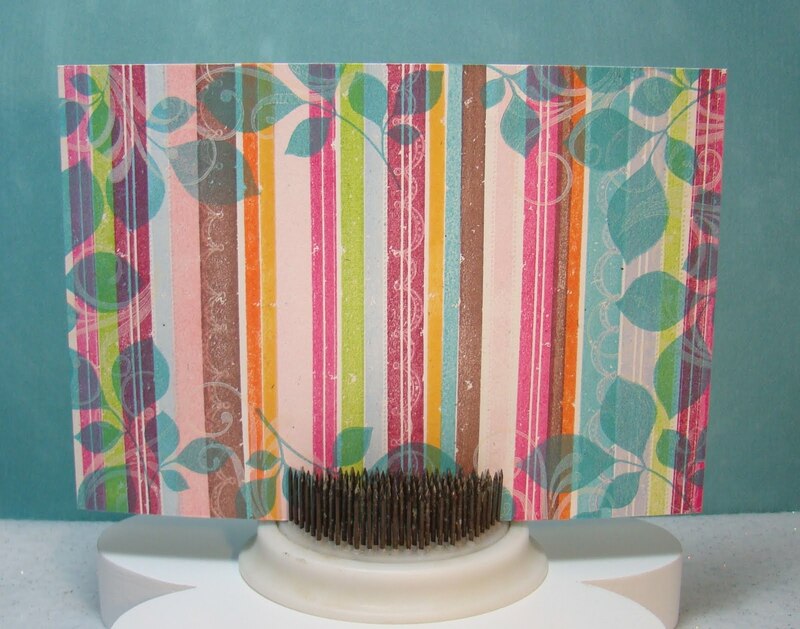 Here's another card with Distressed Stripes. 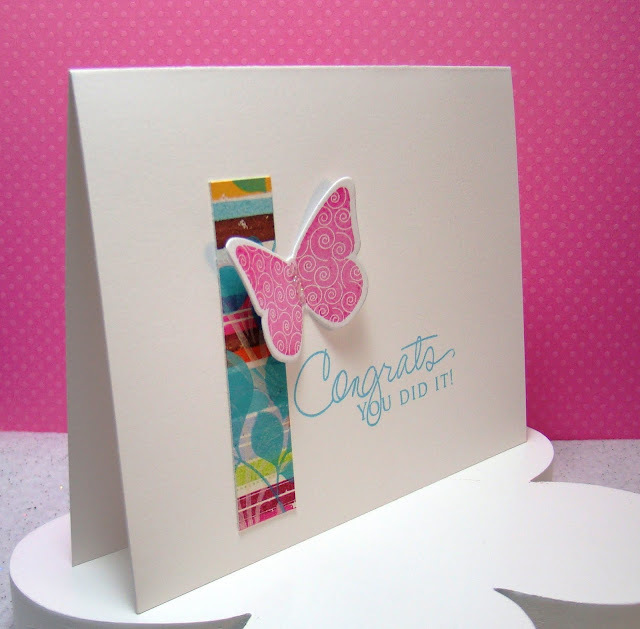 This is my least favorite of the three cards that I've shown you using this set, but I do like how the background and butterfly turned out. I really like this butterfly stamp set! I used the rock and roll technique on the butterfly to get it to be two tones. It's just so soft and pretty! And, I really like the softer stripes too. There are just so many looks that can be created with this Distressed Stripes set! The ribbon is from Hobby Lobby and I really like the softness of it too! Thanks for visiting! What do you think of the new Distressed Stripes set? Have you purchased it yet? Is it on your wish list? I'd love to see what you've done with it! 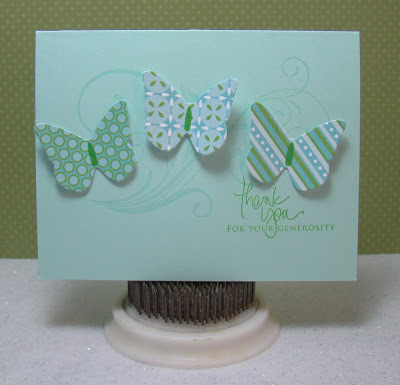 Here's another card using PTI's new "Distressed Stripes" stamp set. I LOVE this set! I found the inspiration for this pattern from a piece of patterned paper I found online but I have searched and searched for it so I could show you the comparison and I can't find it anywhere. So, you'll just have to trust me that it looks as good, if not better than the printed paper! Here's a closeup of the flowers on the Asian Fusion flowers. I used small brown pearls on some of the flower blooms. I like the extra little detail it adds. I also used one of the Tea Dye Duo inks from PTI around the edge of the rustic white paper. Thanks for stopping by! I hope you liked the card! 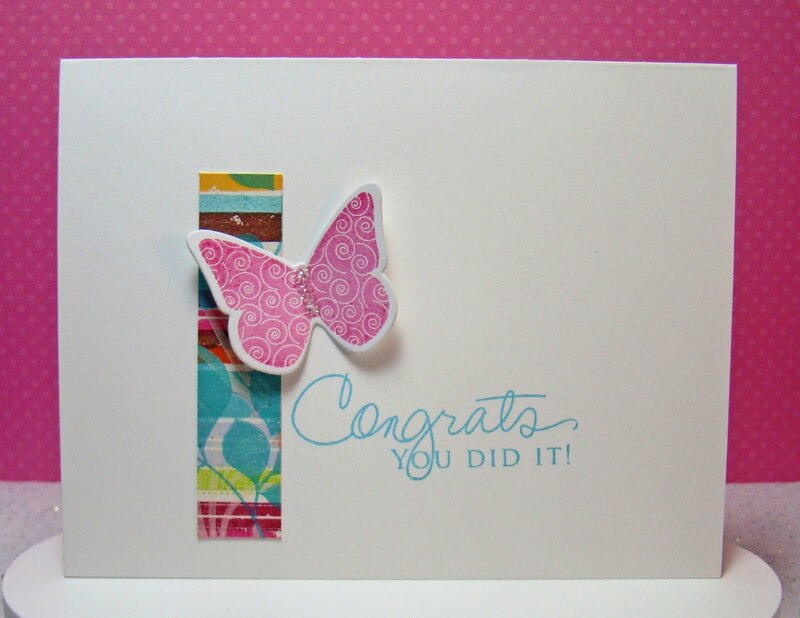 I am so in love with the new PTI "Distressed Stripes" stamp set! I don't usually envision a card before I even start working with a set, but this time I had (have) all kinds of ideas rolling around in my head! I finished 3 cards pretty quickly and I am just very excited about the possibilities that this set lends! I wanted to share one of the striped cards today. I just LOVE the new Hawaiian Shores PTI color! And, paired with Raspberry Fizz...wow!! :) See that striped background paper? Yep! It was made with the new stamp set! See what I mean by LOTS of possibilites!? Here's a closeup of how I did the layers and you can see the stripes in a little more detail as well. I have started using pop dots that are not quite as thick so that it doesn't create quite as much dimension and is easier to mail. Oh, and the sentiment...LOVE! 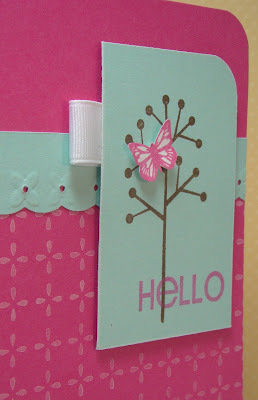 Welcome to the March Papertrey Ink Blog Hop! 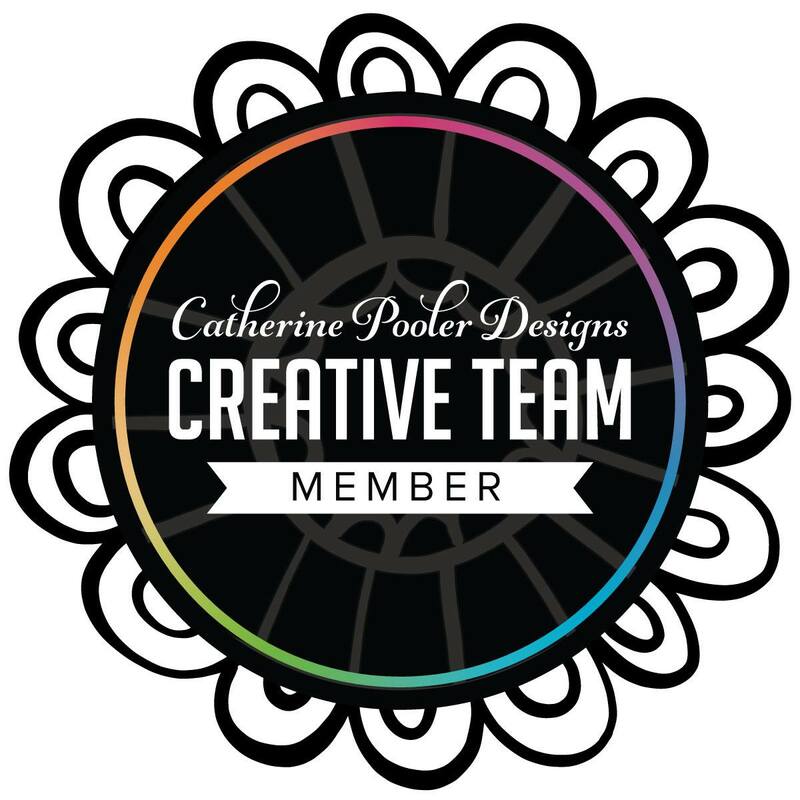 This month's theme is all about buttons and our challenge was to use PTI buttons on a project...however we wanted! But first, let's start with the packaging! Here's a closeup view of the jewelry inside that is made with PTI Vintage Buttons. On the necklace pendant I used Hawaiian Shores buttons on the base and as the top piece also. I LOVE the sparkly Raspberry Fizz button in the middle! The three buttons are glued on to the back of a jewerly pendant base. Here's a view of the duo together. I love that ring too! The colors are just so fun! The photo above shows the ring you already saw above, plus two others made using the Hawaiian Shores & Chocolate Brown buttons with silver wire. I have several shirts in this color scheme that I'll enjoy wearing these with! This ring uses one of the fun flower buttons (this one in Aqua Mist) that are found in many of the button collections! I used just a little bit of a wire loop on the flower to make a flower center and not hide the rest of the button. I also made some pendants to match the rings. All three of them can be seen below. I hope that you'll check out the rest of the blog hop members. Blogs can be added until 11:00 PM Central Time tonight so be sure to check this thread for an updated list! This is a card that I made a while ago for a friend and it has a Spring feel to it. 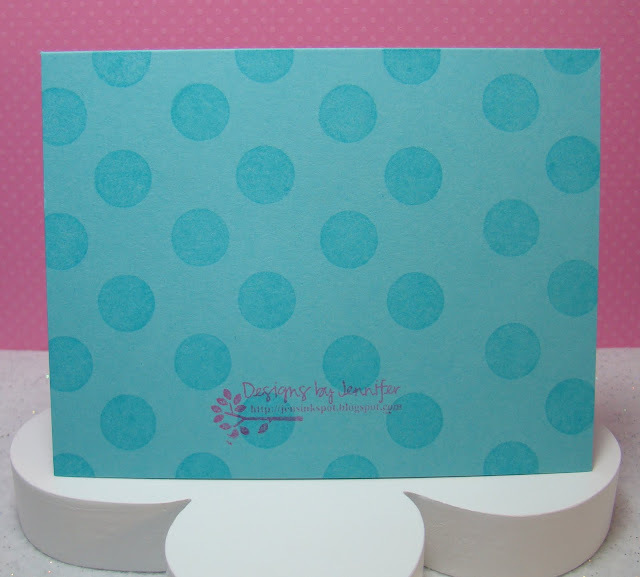 It's hard to see in the photo, but there are polka dots stamped across the bottom of the card. I think that this PTI "Star Prints" set has my favorite sentiment font! I just love the curls on the words and how they fit together. It's just so pretty. I hope that you are having Spring-like weather wherever you are at today also! If not, hopefully you'll see it soon!! Thanks for stopping by! Hi everyone! I'm participating in a blog hop today with some of my stamping friends! I love blog hops and this one has such a fun theme: SPRING!! I'm so ready for Spring! I have four cards to share with you today. I know! Four!! Three of them were super easy and are all very similar to each other. I'm going to start with my favorite though and the brightest of them all! What says spring more than butterflies right? 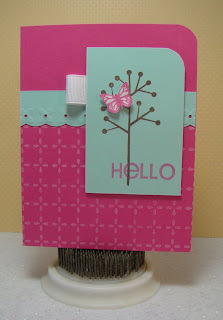 I just love this tree from the PTI "Beyond Basic Borders" stamps set! And the colors? Yep, another favorite color combo! Pretty simple huh? I used one of PTI's new Beautiful Blooms II dies to cut the flowers out. See that paper? Isn't it pretty? Let me show you a closer view. I don't own that paper pack. PTI has this cool feature on their website called "Try Before You Buy". 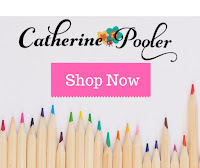 If you scroll down to the bottom of each of their patterned paper packs, you will find this feature. 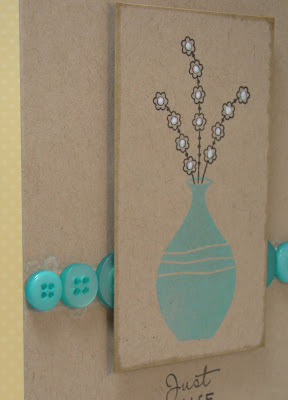 I have loved seeing this paper on other projects but it seems like the patterned paper makes it into my cart and then out again as I add "other" things. So, I took PTI up on their offer and tried it. I printed it onto PTI's white cardstock and then die cut the squares with the die. It is PERFECT for the medium sized die! I made several other cards using this same feature. 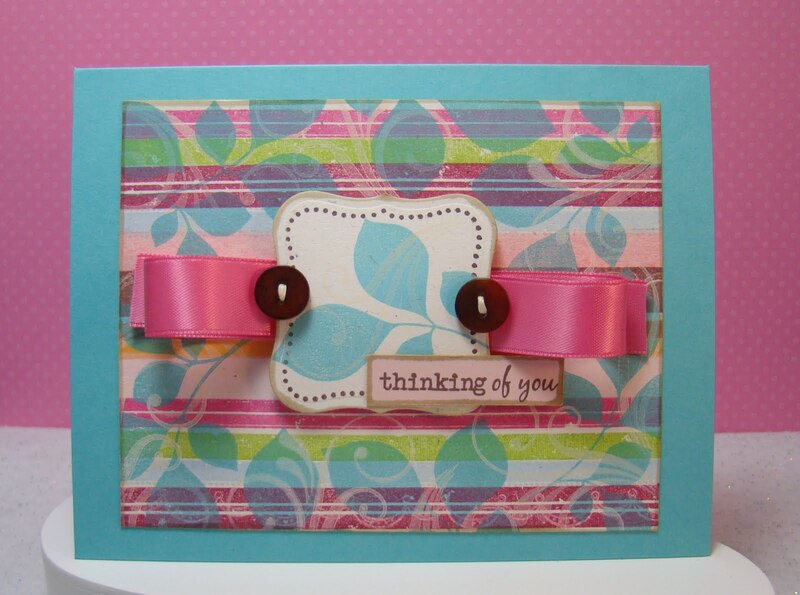 This is another card using the Beautiful Blooms II die. 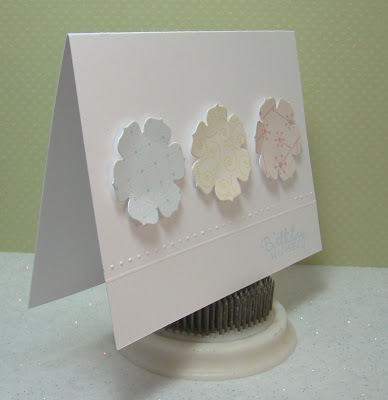 I used my Scor-pal to create the lines at the bottom and I bent the flower petals up just a bit to add a little extra visual interest to the card but to still keep the focus on the clean lines and flowers. This paper is the new Green Boutique paper from PTI. I did the same thing here and used the "Try Before You Buy" feature (but this one I did actually buy, I just haven't received it yet). Thank you SO much for stopping by today! I'd love to hear what you think! 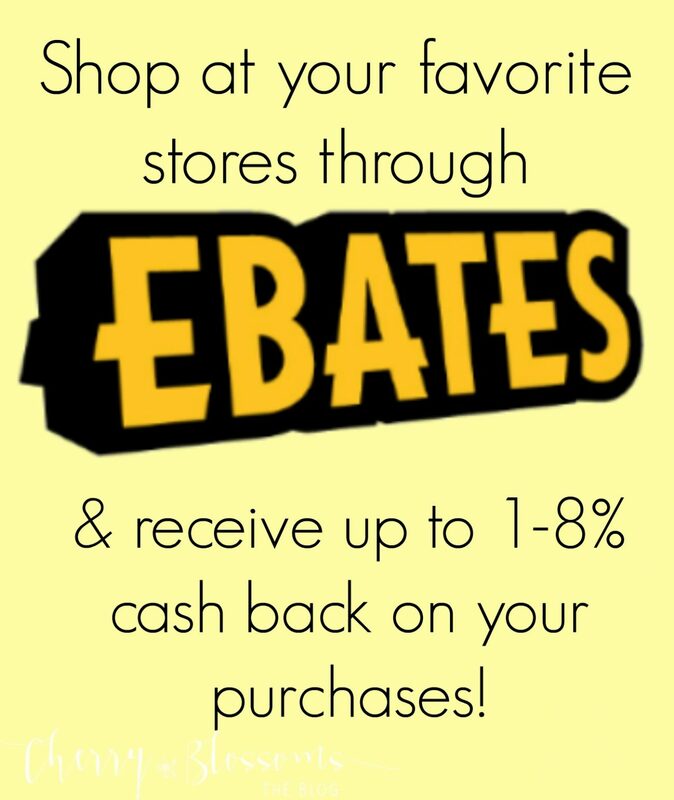 Have you tried the "Try Before You Buy" feature before? There are several other gals participating in this fun Spring blog hop. Be sure to check out their blogs too! This morning when I woke up I had a dream come true! 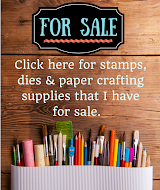 Nichole Heady, the owner of Papertrey Ink, whose stamps I LOVE and have been using constantly, featured my card on her blog! Wow! What an honor! I'm elated! 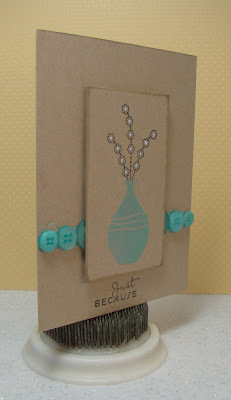 You can see my card on her blog here. When I made that card, I stamped half a sheet of the Guide Lines II in these same colors (and pattern) so that I could cut it up and use it to make several cards. This past week I made a second card using this same sheet and I have enough paper left to make one more. I love using the Guide Lines II stamp set! So many possibilities! I love the aqua mist color! It's gorgeous! When I put this together I wanted a sentiment that fit the softness of the card. I don't like to make sympathy cards so I never have any on hand when I need them. So, for this particular card, I pulled out the "So sorry for your loss" sentiment from "Vintage Picnic Sentiments" and added it to the bottom. 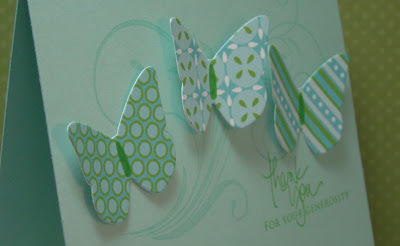 Thank you so much for stopping by my blog today! I appreciate each of you who take the time to visit and also for those of you who comment! I hope you have a great day! I got the newest ink and buttons from PTI today called Hawaiian Shores (hope to get the paper in the mail tomorrow). I LOVE, LOVE this new color! It is my favorite color yet! Way to go PTI! 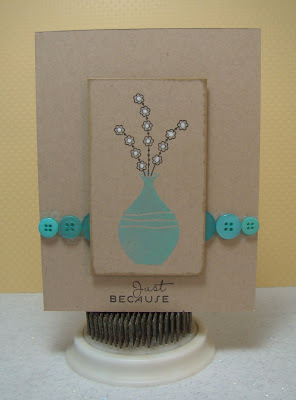 I made a simple card using Hawaiian Shores ink & buttons and PTI's stamp set "Asian Fusion". What did I tell you? Pretty color huh! I wanted this card to just have a simplicity to it. A calmness. And, I think I accomplished that. Instead of ribbon, I used buttons to accent the image...only 3 buttons on each side and then the image is popped up over the top of the largest buttons with pop dots. The centers of the flowers are colored in with a white gel pen and I really like that look. I also stamped one of the border images under the buttons but it is so light you can barely see it popping up above the buttons. If I made this card again, I'd just leave that stamped strip off. I also wanted to define the edges of the image panel and so I used one of the tea duo inks around the outside of it. That added a little more depth to the card. Can I say again how much I LOVE this color???? Thank you so much for stopping by! It means a lot to me that you take the time to visit and also to comment! I just love sharing this hobby with all of you! Here's a fun card that I made last week. A friend came over to my house and we each made a card, based on a sketch. She used traditional red, white & blue colors and I went with a softer color scheme. I told my friend that it almost looks like a baby card with all the pastels. The bow looks kind of funky in this picture but it looks good in real life. I think I just got a weird angle on it when I took the photo. I used PTI's "Tin Type" background set on the Spring Rain cardstock. I love that background set so much! The sentiment and star are from the "Star Prints" set and the flourish is from "Fanciful Flourishes". This was the first time I used the new Plum Pudding pigment ink. I LOVE it!! It is such a soft, pretty purple (and that is saying a lot for a KU Jayhawk fan)! I used one of the Tea Dye Inks around the Spring Moss cardstock and I just really like the look that it gives the cardstock. Thanks you so much for visiting my blog! I hope you have a very good day! 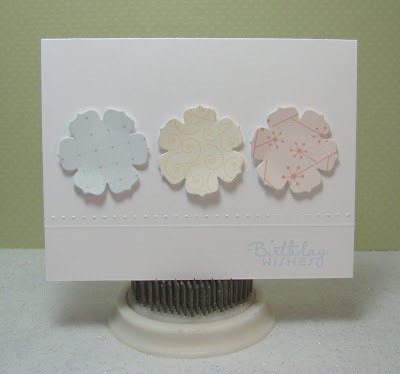 This card uses an ususual color scheme of Hibiscus Burst, Giverny Green & Summer Sunrise. I love that vine image from PTI's Beyond Basic Borders set! It's perfect for this one layer card. I added the sentiment and 2 gold beads to finish it off. This would take no time at all to mass reproduce! This next card is a little bit more involved and has such a soft feel to it. I used Aqua Mist, Sweet Blush & Vintage Cream, along with a little Burnt Umber for this color scheme. I cut the card a little smaller than a normal A2 card and then added the apron lace border along the bottom in Ivory. I also inked the edges with the Burnt Umber ink.